Readers are pretty keen on superpowered school uniforms and microwave-enabled time travel. So keen, in fact, that UDON Entertainment is going back to the print as two of their most recent publications have proved wildly popular in Kill la Kill Vol. 1 and Steins;Gate Vol. 1. The two books have completely sold through their initial print runs, with fans snapping them up in droves. Kill la Kill Vol. 1 and Steins;Gate Vol. 1 are already tough to find in stock at many physical and online retailers, speaking to the resoundingly strong sales performance of both books. In response to voracious fan demand, UDON is already moving forward with second print runs for both titles, with these reprints scheduled to be available at retail by March 2016. In the meantime, Steins;Gate Vol. 2 is available now in finer comic book stores and book retailers everywhere, as well as various online retailers. Steins;Gate Vol. 3 is planned for release in April 2016, with Kill la Kill Vol. 2 scheduled for release just prior to that, in March 2016. Toronto, ON – FEB. 8, 2016 – What do super-powered school uniforms and microwave-enabled time travel have in common? Not much, to be perfectly honest – except that they’re both the subjects of UDON Entertainment’s newest best-selling manga series! 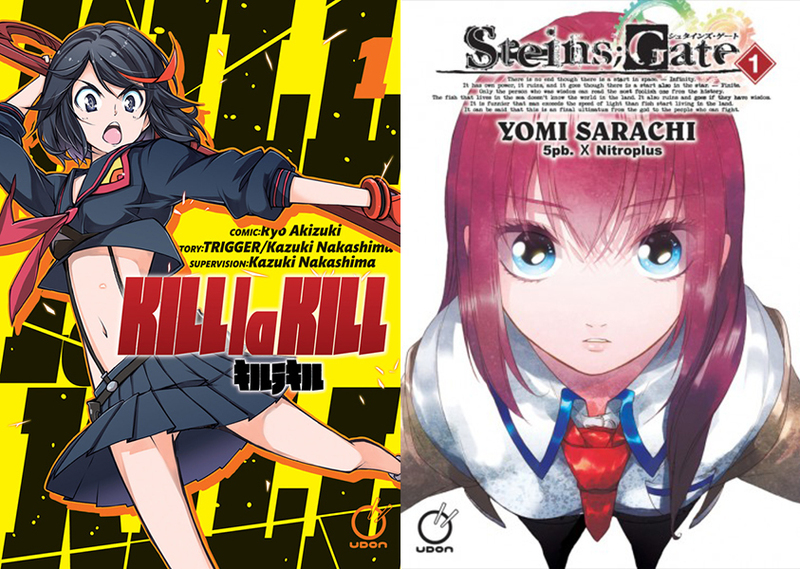 Indeed, UDON is thrilled to announce that the first volumes of Kill la Kill and Steins;Gate have completely sold through their initial print runs, with fans snapping them up in droves! Kill la Kill Vol. 1 and Steins;Gate Vol. 1 are already tough to find in stock at many physical and online retailers, speaking to the resoundingly strong sales performance of both books. Fortunately, those who have thus far been unable to get in on the Kill la Kill and Steins;Gate phenomena will not have to wait much longer! In response to voracious fan demand, UDON is already moving forwardwith second print runs for both titles, with these reprints scheduled to be available at retail by March 2016. In the meantime, Steins;Gate Vol. 2 is available now in finer comic book stores and book retailers everywhere, as well as various online retailers. Steins;Gate Vol. 3 is planned for release in April 2016, with Kill la Kill Vol. 2 scheduled for release just prior to that, in March 2016.